But you've heard SunnO)), so you know what it sounds like. And I'm not writing just to give you the record-store-dweller nerd backstory. I'm just wondering how/if this changes your assessment of O'Malley & Anderson, given that they had seven years prep time before debuting their own act. They've had another nine since to perfect their ritualised performance aesthetic. Keep in mind that Metal was alive, well, and dynamic when "Earth 2" was unleashed in 1991: that same year, Metallica released their "Black Album" and Guns 'N' Roses put out their dual-album blockbuster "Use Your Illusion." (Actually, if Metal HAS a spectral remnant, it's probably the promise of "Chinese Democracy's" eventual release - but anyway...) There was no ghost yet to be resurrected from Metal. What Dylan Carson offered was a more pure, contemplative yet purpose-driven alternative. In this light, Carson becomes the musical equivalent of an ascetic monk surviving on the barest of essentials; SunnO))) become his apostles & champions, though they clutter the proceedings with needless accoutrements & ceremony. So let's wrap it up nicely and call those meddlesome and obnoxious elder statesmen of scene, the Melvins, the John-the-Baptists of Doom. Turning now to Simon's response to my last post. I understood that the point of Simon's comparison between Sunn0))) and intelligent drum and bass was structural and sociological rather than musicological, and can concede its validity insofar as both 'opened up a whole new niche market of listeners' - but it seems to me that it's important to recognise that the very different ways in which Sunn0))) and intelligent drum and bass appealed to this new audience. 'In both cases,' Simon writes of SunnO))) and intelligent drum and bass, 'there’s a sublimation (or sublime-ation?) of the original music, a shedding of its coarse, rowdy, plebeian trappings and a distilling away of it generic impurities to reveal an essence.' This works perfectly well as a description of Sunn0))), but I think that only the first part applies to intelligent drum and bass (i.e. the shedding of the coarse, rowdy, plebeian trappings). The drive in intelligent drum and bass was famously towards more musicality (even the term 'drum and bass' as opposed to 'jungle' was part of this), added 'complexity', the aim to make the sound more closely resemble existing templates - a rhetoric of progression as the alibi for formal conservatism. Whereas the 'essence' that Sunn0))) scoured down to was less musical than Trad metal. As regards KLF, well, Drummond may well be sincere and serious but if that's the case, he's cursed with looking the opposite. (The last thing I heard from Drummond was, funnily enough, this godawful metal group he'd convened for Iain Sinclair's London Orbital event at the Barbican.) Drummond for me is like Mclaren, forever tainted with all the worst aspects of art schools and Situationist theory, forever committed to translating everything into a scheme or scam over which they, of course, have mastery. KLF's situation was Baudrillardian, not Bataillean, as was summed up by the burning of a million pounds: the supposed act of transgression became immediately legible as yet another artworld-type publicity stunt, the promised access to an unmediated Real immediately became ensnared in all of the epistemological conundra of hyperreality (did it happen or not?) Drummond has the soul of an ad man, and not even burning a million pounds could change that. (In fact, it looked like just the sort of gesture an ad man would come up with.) It's not even that I dislike the KLF records - they had a brute appeal. But every gesture the KLF made seemed designed to make us aware of the Machiavellian calculating egos responsible for it. When they wore robes, we were never allowed to forget it was Drummond and Cauty who were wearing them. 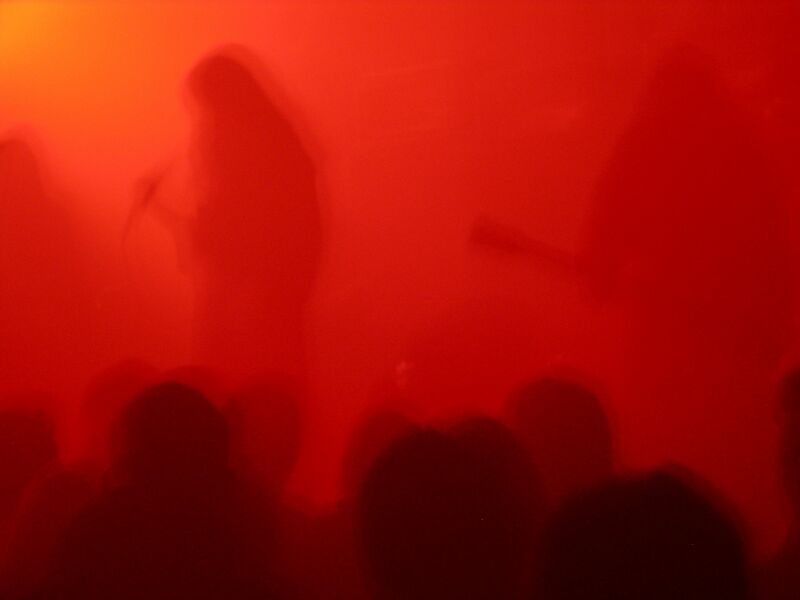 This, again, by contrast with Sunn0))), who seem to genuinely use the robes to anonymize themselves, so that the audience's attention is directed towards the physical force of the sound. A Mess of Help and others wonder why it is has taken Simon and me so long to get around to Sunn0))). (Emily at Sexual Ambiguities goes so far as to claim that the turn to metal is a catastrophic sign that the game is up.) At this point, it is worth remembering one of the original prompts for this discussion, i.e. Simon's Pazz and Jop essay, which was precisely about the dearth of innovation in other sectors, the places where we'd normally look. And it seemed that the very moment that Simon paired metal and dubstep, the Vex'd/Distance mix appeared. In my own case though, it was Dominic's superbly evocative posts on Xasthur - who in many ways interest me more than Sunn0))) - which did most to pique my interest. A typical passage will feature separate guitar parts, panned to the far left and far right, playing in unison or consonantly in harmony but occasionally veering off in different directions so as to producing jarring collisions - these seem accidental at first, but are ratified by repetition so that the “wrongness” becomes structural, like the eldritch geometry of Lovecraft’s ancient architecture. One part will shift up a semitone, leaving the other anchored where it was but now drastically out of key, before returning to its original root. The resulting discords are not so much the “outside notes” of jazz as the “simultaneous false relations” of early Renaissance composers such as Carlo Gesualdo: deliberate tonal contradictions introduced into an otherwise conventional tonal system (most of Xasthur’s themes are in the harmonic minor scale) for expressive effect.